A few years ago, I jumped into the world of Cloth Diapers. It was while I was expecting my second that I started to think about all the diapers I was going through with my daughter. It was a while reading a favorite blog where the post was about how easy cloth diapering could be that I became interested in learning as much as I could. And I love a challenge in my life. The first thing modern cloth diaperers will tell you is how much they have changed since the days of big pins and services to launder them. The first image people have in their head is of these boring messy pieces of fabric. They are not only easy, affordable, and green but they are cute too. 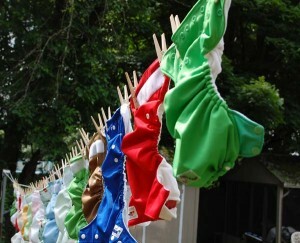 It is for all those reasons that I really wanted be a cloth diapering family. The hardest part in it all is learning what it all means and what will work best for your budget and needs. After getting the chance to learn about the different options, buy some to try out and then winning a bunch of diapers to add to my stash, I wrote this post on our family blog. It is a review of what I have used on my son. And now I feel like there are some new great options out to try on our new arrival this winter! 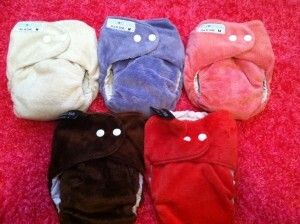 I’m also excited to add some pink diapers to the mix so I ordered a few Itti Bitti D’lish Snap In diapers. The colors are so bold and they may be the softest diapers I have ever felt. They remind me of the soft fur on a Pillow Pet. I have to add a few at a time for cost reasons but hopefully these will make up the bulk of my diapers and I can share how great they are with others. I enter all kinds of contests to try and win extras. Locally, there are not a ton of places to buy cloth diapers and that can be scary for folks looking to see and touch them before committing. I’m always excited to share what I know with other moms when they seem interested in the process. There is a great shop in Somerville that I have had a chance to visit and it’s a great place to ask questions and get acquainted with the options. They also offer workshops for those interested in learning more, http://diaperlab.com/visit/workshop.php. Here are some of my favorite cloth diaper links if you are interested. I’d also love to answer any questions you may have. Cloth Diaper Whisperer is full of great information and contests to win diapers/accessories. Kelly’s Closet is a great site to purchase diapers! Lots of reviews here on Diaper Pin of the differing options. All about the different types, All About Cloth Diapers. May I add a local place you can buy em from? She is out of her own home for now in Scituate, MA, you can order them online http://www.cutiebooties.com and she is at the Scituate Farmer’s Market every other week on Wednesday afternoon 3-7. Reasonable prices and great seller too! This is great info! Thank you for sharing! My first was clad almost exclusively in FuzziBunz with little to no rashes, good savings on not having to buy paper diapers and not too much extra effort on my part to keep the cloth ones going. My second used the same ones, but was subject to some nasty rashes and infections, so I used more paper diapers with her. My third uses cloth at home and paper when we are out so I can balance cost with convenience. I am now looking for a good maker of reusable/washable “pull ups” for night training. Any ideas? Martianne – I have used the Imse Vimse Training Pants and they worked well for training my daughter. They have many more options now though. Happy Heinys makes a pocket trainer I heard good things. Can I add my link here? I am a local cloth daipering mom. I live in Bristol County area. Right now I am only an online store but my goal is to become a real brick & mortar store in the near future. I’m looking for some locals to start a cloth diapering group as well!